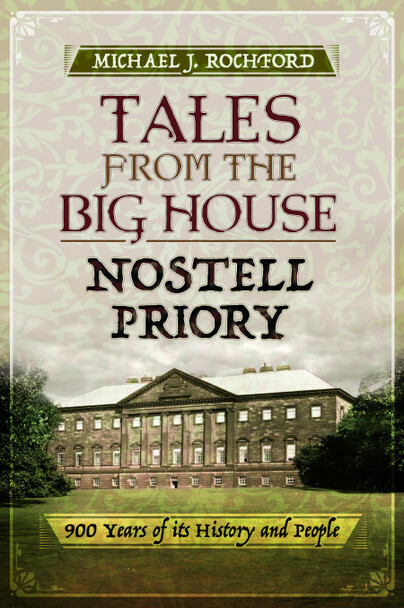 You'll be £14.99 closer to your next £10.00 credit when you purchase Tales from the Big House: Nostell Priory. What's this? As long ago as the twelfth century, St Oswald’s Priory at Nostell, near Pontefract, was home to canons of the order of St Augustine, and until it was dissolved during the reign of Henry VIII it was one of the wealthiest priories in the country. In secular times, a grand house on the site was home to the Gargrave family, whose rapid rise had seen Sir Thomas Gargrave attain the offices of Speaker in the House of Commons and High Sheriff of Yorkshire during the days of Queen Elizabeth I. But within a couple of generations the family was ruined. Sir Thomas's grandson and namesake, into whose hands Nostell had come, was executed in 1595 for committing murder by poisoning, a deed shrouded in mystery and misinformation for centuries – until now. In 1654, Nostell became the property of the Winn family, who were soon made baronets by Charles II, having shown him great support during the Civil Wars. The following century, Sir Rowland Winn, 4th Baronet of Nostell, began work on a brand new, magnificent Palladian house, known today as Nostell Priory, in honour of the medieval canons who had once worshipped on the site. His descendants would cede the title, but in 1885, another Rowland Winn of Nostell, who was Conservative MP for North Lincolnshire, was made Baron St Oswald following his party’s election success. Featuring stories about the formidable Swiss wife of the 5th Baronet, whose daughter ran away with the local baker, grand political rallies, secret marriages, and even murder, Tales From the Big House: Nostell Priory offers the reader an exciting tour-de-force through some of the history of the site, and the owners and their servants who made this great house their home. As a young boy in the fifties, I would be shoehorned into the back seat of my father’s dilapidated Ford 8 for a Sunday spin into the Yorkshire countryside. One of my favourite destinations was Nostell Priory, not least because with luck there’d be a hold-up in the traffic on our way back to Huddersfield, and I’d miss having to sing in the choir for Evensong. Nostell might have been the target, but we never went into the house and I hadn’t a clue about its history, a deficiency I never really missed until I read Michael Rochford’s entertaining book. Founded in around 1121, the Priory led the uneventful life common to most monastic communities until the sixteenth century when it was quickly dissolved under claims of scandalous behaviour, being purchased by the very agent who had inspected and condemned it, Dr Thomas Legh. From this point onwards the history of the house becomes engrossing, passing through successive owners until it became the seat of the Winn family, whose life reads like episodes of a period drama, with the arrival of the Swiss-born wife of the future fifth baronet in 1761, the elopement of their daughter with the household’s baker, estrangements and reconciliations, and the clandestine marriage in 1915 of the family’s heir to a chorus girl. Amidst all this turmoil, grandiose plans, especially of the fourth and fifth baronets resulted in the building of a fine Palladian mansion, with decoration by Robert Adam and furnishings by Thomas Chippendale, one the finest collections in the country. Now looked after by the National Trust, the house is visited by many thousands each year, and it is fitting that the quality of workmanship displayed inside is matched by Rochford’s book. Well and clearly written, much of it based on original correspondence, it is an entertaining read and in no way deferential to the Winn family, with emphasis placed on their heyday in the rumbustious eighteenth century. They appear as they were, an aristocratic family, ambitious for effect, feuding among themselves, unwilling to pay their bills, and with little concern for others. Illustrations, which appear throughout the book, are totally relevant, and the list of sources is quite comprehensive considering the book’s popular appeal, appearing with rather more description than usual about their use in research on the house’s history. In all, a highly recommended book. Its appeal is likely to be to those who visit the house or live nearby, rather than elsewhere in the country, though I could imagine any reader would be interested in the goings-on of the Winn family in the eighteenth century. I really enjoyed reading this book. It was clearly written and a great deal of research had obviously gone into it. A highly prized find! This is Mr Rochford's second book and, like his first, it is very well written and obviously very well researched. Mr Rochford really brings his subject to life in a most entertaining way. If you buy this book, you won't be disappointed. A wonderful book. A very interesting and informative read. I Liked it very much! A lot of research has gone into this book. The author gives a fascinating insight into the families who lived in Nostell Priory in the past to the present day. Although this is not a guide book, there are lots of interesting details about the house and its contents. I enjoyed reading about Thomas Chippendale and the furniture he made for Nostell Priory, which is still in situ. There are some good pictures in the book, plus old recipes and old newspaper articles about the people of Nostell. Michael J. Rochford holds a BA (Hons) and a Master’s degree through the University of Leeds, having studied at Bretton Hall campus in the heart of the Wakefield countryside. He was born at the old Manygates Maternity Hospital and married at Wakefield Cathedral, having worked at ‘Prophet Wroe’s’ Wrenthorpe Mansion, Melbourne House. Michael runs a history research company, Heir Line Ltd (www.heir-line.co.uk), with his wife Caroline, and has edited several published titles on Victorian and military history. He is also a member of the Yorkshire Archaeological Society.